Sports Interaction Casino offers a great selection of casino games with over 800 games that range from live dealer to DC Comic slots and much more. Focusing only on the Canadian market they’ve build an online casino for Canadians by Canadians, including a friendly and knowledgeable Canadian customer service staff. 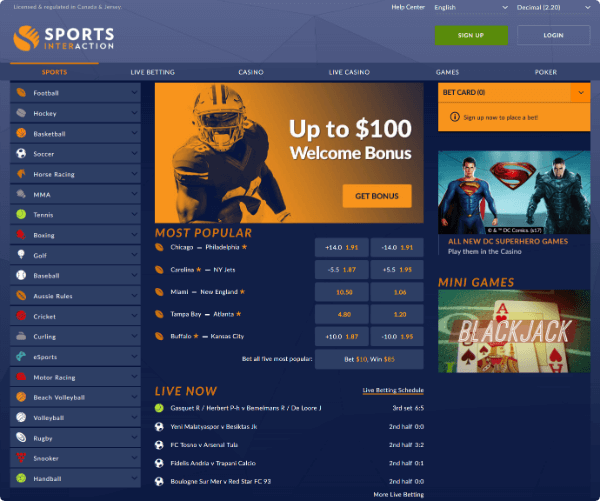 Widely known in Canada for their sports betting product, Sports Interaction has quietly built one of the best casino offerings for Canadians. Sports Interaction casino was Playtech’s first Canadian partner back in 2003 and they continue to work together offering players a great selection of games. 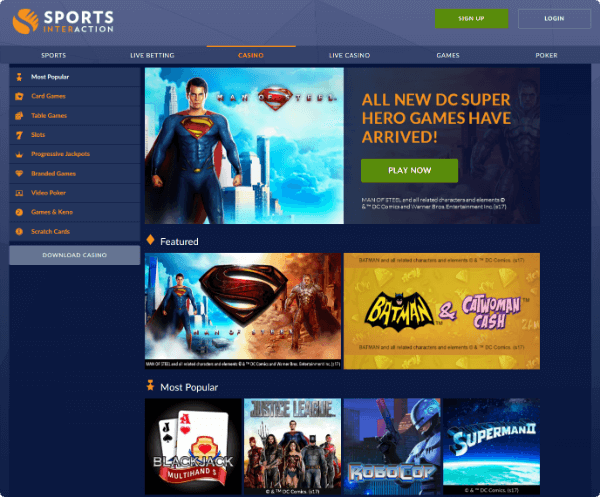 Included are DC Comic slots such as Batman, Superman and Justice League with Sports Interaction casino being the first to offers those to Canadians. Unlike their competitors who are operated by an offshore company, Sports Interaction is operated by Mohawk Online, a socio-economic initiative wholly owned by The Mohawk Council of Kahnawake; thus making them the first, First Nations government in Canada to operate an online casino. Revenue generated by Mohawk online is invested back into the community to help create a better future for the people of Kahnawake. Sports Interaction is also licensed by the Jersey Gambling Commission and Kahnawake Gambling Commission. With a strong backing, excellent variety of casino games and a focus on the Canadian market, Sports Interaction Casino is an excellent choice for Canadians. Sports Interaction Casino offers 800+ casinos games so there is no shortage of options for even the pickiest of players. That huge selection of games includes: Scratch cards, keno, video poker, slots, table games, card games, progressive jackpots and branded games. Are you interested in branded slots with cool movie titles? If so, Sports Interaction Casino has the best line up in Canada and whether you enjoy video slots featuring the biggest comics like Superman, Batman and Justice League or you prefer some classic movie titles like Rambo, Ace Venture or Basic Instinct you’ll find titles that are sure to entertain.  For players looking more at table games, you’ll find everything that you’re looking for. With dozens of video poker options to blackjack, craps, roulette and more there is no shortage of options. If you’re looking for a more real experience, try out their live dealers. Their live dealer product makes you feel like you’re in Sin City as you can interact with the live dealers while watching them deal your cards. For players on the go, Sports Interaction Casino has you covered with an impressive line-up of Casino games available on mobile including all your favourite branded slots, a huge selection of table games and even live dealer. And to make withdrawing your winnings easier, you can process all transactions from your phone. Slots-Online-Canada.com has secured an increased bonus offering for players who sign up through one of our links. 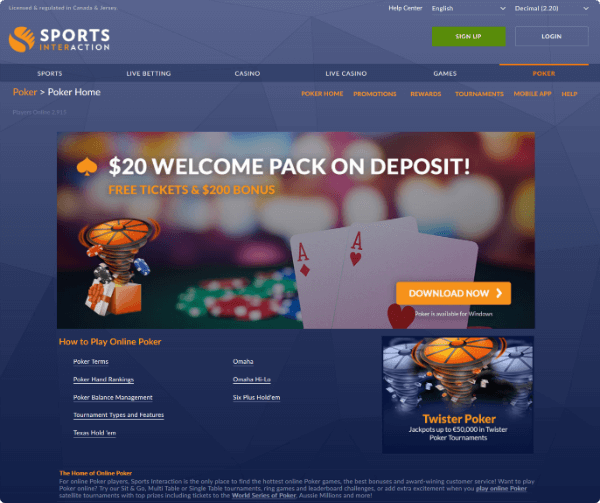 Typically new players at Sports Interaction receive a bonus of 100% up to C$ 100, however through slots-online-canada.com that increases to 100% up to C$ 200. Also, every new player to Sports Interaction receives an additional $10 risk free bet on live dealer roulette. That’s right, if your first bet on roulette in live dealer is a loss, you will be refunded your wager (up to $10). To sweeten the pot even more, for a limited time when you make a deposit, you will be given a $10 blackjack credit. Following the theme of catering to Canadians, Sports Interaction’s customer service is based in Canada, with Canadians. Their friendly and knowledgeable staff can easily be reached 24/7 via email, phone and live chat. Whether you speak either of Canada’s official languages of English or French, their customer service staff is there to help. Many online casinos accepting Canadian players have limited banking methods, that’s not the case with Sports Interaction. With nine deposit options backed by the Canadian banking system, deposits and withdrawals at the Sports Interaction Casino are easy and secure. Deposit methods include: VISA, MasterCard, Instadebit, iDebit, Instant Banking, eCheck, PaysafeCard, EcoPayz and Entropay.